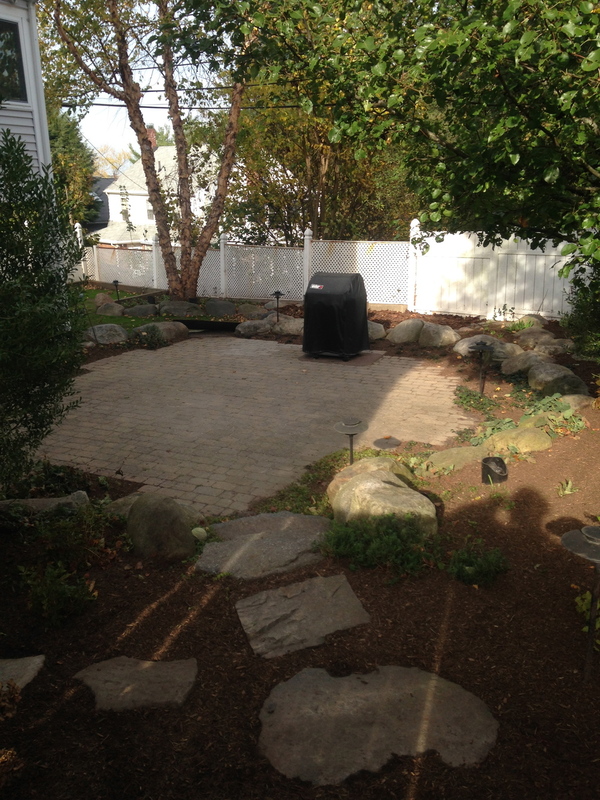 We work with clients across eastern Massachusetts on a diverse range of landscape needs. Below are photos of some of our recent design and installation projects. You will find photos of additional work throughout the website. This homeowner reached out to us because they wanted to neaten up their front yard and re-do a corner of their property that had been let go for several years. We came up with a design that blended elements of formal style along the front of the house transitioning to an informal, natural style in the front corner. We preserved existing plant material by transplanting it to other parts of the yard, thereby reducing waste and costs to the client. Our design incorporated native plants throughout the garden to provide ecological benefit to the species that live in the neighborhood. We directed the downspouts to the large front corner planting bed which sits at a slightly lower elevation to capture and absorb runoff. Finally, we installed a stepping stone path to allow for easy access to compost bins along the side of the house. Our client had a small brick patio that felt tucked into a corner and did not provide an opportunity to extend their home outdoors. They were tired of not being able to entertain friends or fully enjoy their backyard. We designed and installed a large bluestone patio with granite steps leading down from the house and front porch. We arranged the stones in a special pattern using a variety of sizes, which gives the patio a random, yet engineered look and sophisticated appeal. The large square footage provides ample space for a large table and outdoor entertaining. The patio features an extended round area with a built-in firepit where family and friends can gather to keep warm on brisk fall nights. This site was previously used as a rental property and the landlord put in no effort to maintain the house or the yard. 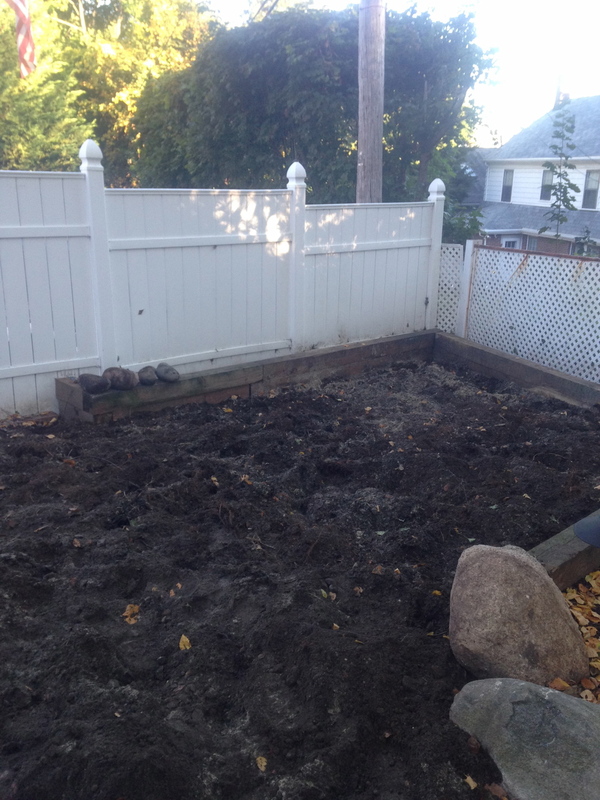 The new owner contacted us to clean things up and come up with a design for a usable outdoor space. This project had many challenges, including invasive plant removal (Japanese knotweed and Oriental bittersweet), excavation and disposal of an enormous pile of fill and debris, rebuilding a rotted deck and stairwell, and coming up with a design that provided privacy from an adjacent city park. We came up with a design that included a stepping stone path, lined with planting beds, that wraps from the front of the house to a bluestone patio in the back. 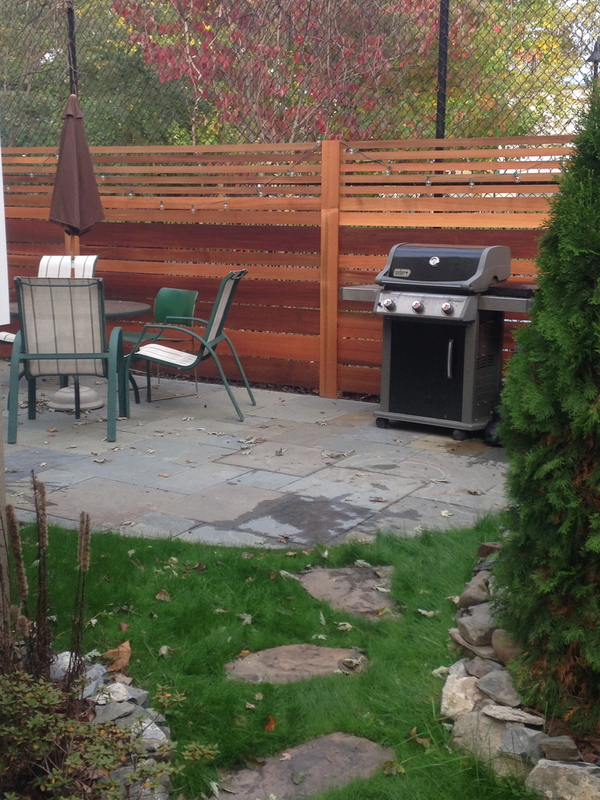 We installed an arborvitae hedge and a custom-built red cedar fence to add privacy elements. Many found building materials, such as bricks, stones, and cinderblocks were reused as edging for the planting beds and other landscape features. We were contacted by a young couple who had moved into a house that was formerly owned by an avid gardener. The yard was absolutely filled with plants, requiring a great deal of effort to keep everything maintained. With busy careers and a new baby on the way, our client's lifestyle could not keep up with the amount of work being demanded by their yard. We came up with a plan to remove a lot of the overgrowth and implement a simple design that would be visually appealing yet easy to maintain. As part of the renovation we removed an unflattering concrete walkway and installed an antique brick path bordered by granite cobblestones and small planting beds for annuals and seasonal color. In the backyard we tore down an old jungle gym, removed overgrown shrubs, and pruned up a large unkempt river birch to maximize space. The final touch was improving the turf soils and helping to establish a newer, healthier lawn.